Can't stop! Can't put it down! Over 15 million people got hooked on it! Casual action game popular among high school girls and female office workers! 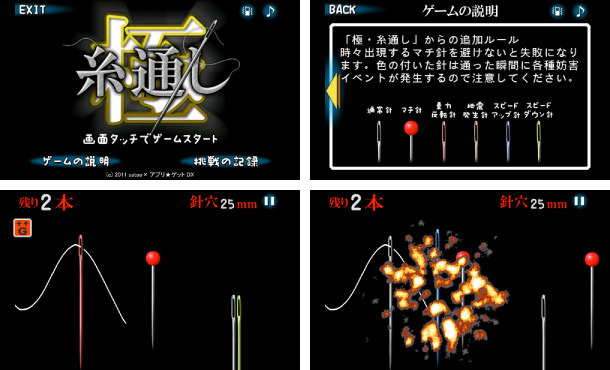 Itotooshi is a game created by genius game creator satoo, and it is the ultimate game for killing time. Maneuver the thread up and down through the eye of the needle. The more you get through the eye, the harder it gets; and the thrill you feel when you succeed is great. It is an addictive game that makes you forget time. Though it may be hard to maneuver the thread, the operation is so simple that everyone can play. It is a masterpiece one-button game that has been featured on TV and in magazines with many TV celebrities being hooked on the game. The game is currently distributed through the smartphone version of AppliGet DX. 1. 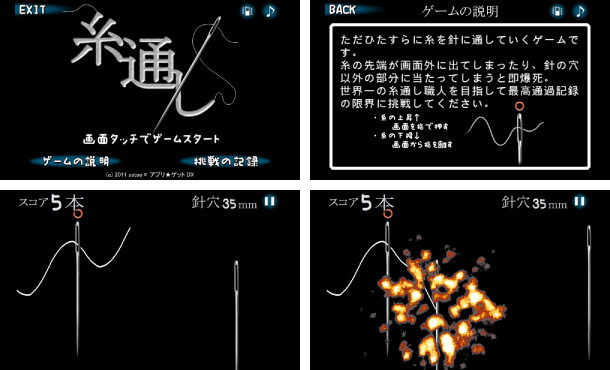 This is an upgraded version of the addictive original mode, where players merely maneuver thread through the eye of the needle, in which new elements such as speed-up, speed-down, earthquake, and reverse gravity come into play. 2. "Challenges by satoo" features 50 stages designed by satoo (the original creator). During the Japanese-style cell phone (commonly known as Galake) age, Itotooshi-Max won first place in the NTT docomo iMenu monthly game ranking. The monthly iMenu game ranking is a ranking of game popularity announced monthly by NTT docomo. In the February 2012 ranking, the Itotooshi game won first place over other famous games such as Super Dragon Ball RPG and Dragon Quest III, and long-time favorites such as Zookeeper and Tetris Diamond. Itotooshi-Max was ranked 3rd in the December 2011 ranking before moving into the number 1 position in February. Other Itotooshi series have also won 1st place in domestic rankings for iPhone, and the Smartphone and Feature phone version have become popular among children and adults.